MANHATTAN — Upper East Side residents continue to worry that the dust and fumes from the Second Avenue subway construction is harming their health — despite an MTA study that assured them the air was safe. After a federal safety inspection from November, which recently came to light, found a worker without a properly fitted face mask was exposed to excessive levels of silica — a carcinogen that can cause a fatal lung disease — the area's city councilwoman is now calling for an extra layer of testing. Councilwoman Jessica Lappin introduced a measure on Wednesday that would require the city's Department of Environmental Protection to monitor the air near the construction site and publish monthly results online. If dangerous levels of pollutants are found, the DEP commissioner would be required to take action, according to Lappin. "I constantly hear about the Second Avenue subway cough and other health concerns," Lappin said in a statement. "Residents deserve to know if the air they are breathing is safe." Many people living near the blasting and drilling claim they've developed chronic coughs, asthma and other problems they believe are associated with building the massive project. Around the neighborhood, people call it the "Second Avenue subway cough." Their fears prompted the MTA to conduct an air-quality study for four weeks, starting Sept. 12, at 10 above-ground locations between East 69th and 87th streets. The results, presented in January, assured residents there were no harmful levels of pollutants. "Ongoing air monitoring is already in place that provides real time monitoring along the Second Avenue construction site," an MTA spokesman said, adding that the agency's independently conducted air-quality study confirmed the work does "not violate health-based standards or guidelines." 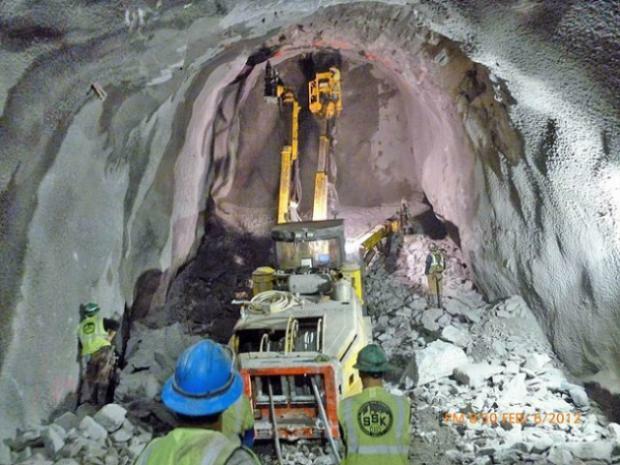 MTA officials emphasized that the silica found at the work site underground — where workers are supposed to be wearing proper protection equipment — falls to the floor of the tunnel and doesn't float upward. It is "essentially impossible for it to impact the air quality at the street level 100 feet above," an MTA spokesman had said. Lappin, however, wants more assurances. "The MTA says the air is safe, but we need to know for sure," she said. "Monthly testing by an outside agency would help us breathe a little easier." The DEP did not respond to requests for comment. Manhattan Borough President Scott Stringer helped craft legislation with Assemblyman Dan Quart, who introduced a bill in Albany last month, calling for the state Department of Environmental Conservation to conduct an air-quality analysis of the blasting area. The $4.45 billion first phase of the project, which will extend the Q line from East 63rd up to East 96th street, is expected to be completed by December 2016.